Greater Pittsburgh GTO Car Club – A Great Car in a Great City! A Great Car in a Great City! The Greater Pittsburgh GTO Club is for any enthusiast interested in the enjoyment, restoration, and preservation of the Pontiac GTO. You do not need to own a GTO to become a member. Along with our beloved GTOs, our club members and their families love to get together at the various club functions & events held throughout the year. Typical events include cruises, shows, picnics, parties, and more. The excitement that a GTO brings is a wonderful experience and is only further enhanced by being a member of the Greater Pittsburgh GTO Club. Meetings are held on the third Tuesday of every month. Check the Calendar for the meeting location. The meetings start at 7:00 PM but come join us for dinner first at 6:00 PM. We are a proud member of the GTO Association of America (GTOAA). Our club requires GTOAA membership. The club is involved in many activities throughout the year. We love to get together at cruises and enjoy the cars, friends, music, and summer weather! On a monthly basis, we get together at a restaurant for dinner and to discuss club business. We have Fun Runs to destinations and attractions to enjoy our cars and spend time with our friends. We enjoy a picnic at a local park every summer. It is a well attended, fun event for the whole family. We have a very nice Christmas party every year as well as parties hosted by club members. We realize how fortunate we are and we raise money for charity as a way of giving back to our communities. Please give our club a try! The Greater Pittsburgh GTO Club is a chapter of the GTO Association of America (GTOAA). 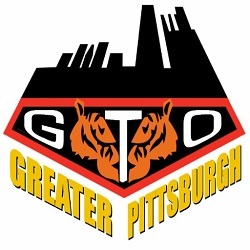 All members of the Greater Pittsburgh GTO Club must be members of the GTOAA. We will collect dues for both organizations. Greater Pittsburgh GTO Club dues are $10 per calendar year. GTOAA dues are $35 per year for US residents. To join our club, please print, fill out, and mail in our membership application. Instructions are included on the application. To sponsor our club, please print, fill out, and mail in our sponsor application. Instructions are included on the application. Legal disclaimer: The Greater Pittsburgh GTO Car Club and/or its chapter officers/members/affiliates nor the GTOAA take no responsibility for any liability related to this website or any of its contents within including but not limited to all photos and text.